Grape trunk diseases, know in the scientific community as GTD, are fungal diseases caused by various different pathogens. Some of these are well known, for example, Esca and at the end of the 80's there was a resurgence and also the appearance of new diseases. The project studied diseases found in productive vineyards: Esca, Black Dead Arm, Petri disease and Eutypa dieback. These are not diseases that are easily managed for various reasons: due to, the multiple aetiologies (several pathogens are found on the same plant and therefore identification based on external symptoms is very difficult), the similarities and discontinuity of the symptoms, the strict correlation with vineyard practices and the lack of active compounds to contrast them. 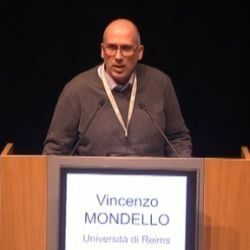 Vincenzo Mondello in his presentation within the Winetwork module at Enoforum 2017, describes what was achieved in these last years of research and summarizes the results of the scientific group involved in the project, in particular about, the early diagnosis of the diseases, the chemical products and biocontrol agents studied, as well as tips in order to limit the symptomatology, protect pruning wounds and apply the best methods to manage the disease in vineyards and nurseries.